Women live throughout their lives in a constantly darkening world of self-doubt, no matter how beautiful they are. Fortunate is the man who realises that fact. Weight is down to 104.9 kgs, another milestone passed. Thirty-two pounds down in six weeks. 1:15 p.m. we drive out to Eton in the Skoda with Paloma, Adam, and Jessica for Sunday lunch; I pick up the Pigmobile from the White Heather garage. The smashed window has been replaced. The engine is pretty frozen, and I drive it back with Jessica, via Eton where I have a quick coffee. Lunch sets me back around a hundred pounds using up the rest of the ---'s kind donation. I'VE been off painkillers of any kind for four or five days now. Soon I can dispense with the sticks. My German lawyer informs me of progress on our action concerning the pirating of my Rommel biography: "Soweit sich nichts neues ergibt, werde ich nächste Woche nochmals die Firma teamWorx anschreiben." I reply: "Thank you. Nächster Schritt scheint, irgendwie Einsicht ins Drehbuch zu bekommen." I have always assumed, perhaps erroneously, that Hitler was a practicing Roman Catholic. I have based this assumption on what he wrote in Mein Kampf and the fact that, unlike Himmler and Hess, he never formally resigned from the Church. Recently I have had this assumption challenged by several quotes purportedly made by Hitler taken from his "Table Talks." So my question to you is this, did Hitler think of himself as Christian? I reply: "Hitler paid his Catholic church tax dues until the end. Read my book The War Path." I am anxious to give Jae a helping hand up, so please give me a heads-up when you see more of her writings. I will tacitly link to them. K. disagrees and screams at me; I have to admonish him: "You are like a dog chewing over an old, much-buried and disinterred, bone. . . Why on earth should I not post links to her essays, which are very much in line with our thinking?" I add a German proverb: "Cobbler: Stick to Thy Last." I point out: "Trawling? I have never done so. Today a Gisela -- sent me the link to her latest article, which I then posted as I found it to be well written." IN the late afternoon I drive Paloma to Gatwick airport in the Pigmobile, now that it is legal again. On the M-25 a huge foreign truck bears down on the inside lanes, flashing at cars to get out of the way. It then comes up to within five feet behind us, and I tap the brake lights as a warning to stand back. Paloma screams hysterically . . . and is seething with rage until we get to the airport. 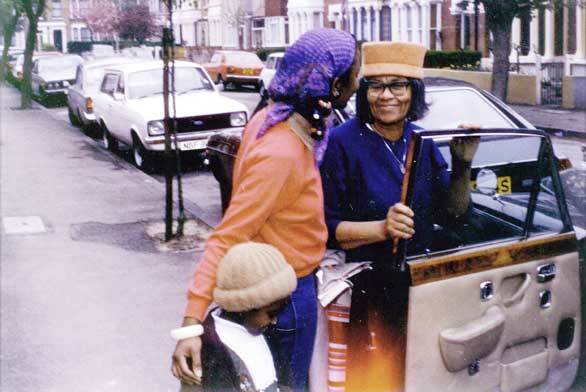 April 1981: In his Rolls-Royce, author David Irving has just driven his personal assistant Wenona Bryan (left) home to Wanstead, in East London, where her mother greets her. This is Wenona. I have been thinking about the past and feel that I have never really expressed my appreciation for all the help and support you gave me back in the 1970s/1980s. I know you have had a rough ride in recent years -- in fact journalists somehow got hold of me and wanted a comment from me. (Which I didn't give.) I think we had some contact about that at the time and then, as usual, life has got in the way. I trust you are well and I just wanted to say thank you for your help in the past. [ WHEN I spoke at the University of Reading in 1979 despite the usual riots, Wenona was the student who asked the brightest question about the Nazis. She was Black, her parents being immigrants from Barbados. I offered her a summer job, and she worked for two years for me as a personal assistant, i.e. one-on-one. [ In 1981 Wenona told me she was getting married, and invited me to hazard a guess about her husband-to-be. Yes, she then said, he is White. I asked what his parents thought. "They have come to terms with it," she answered cautiously. "They accept it." And her parents? "My mother is crying all day, and my father says he's going to throw me out of the house." I don't believe he did, though. He was a simple carpenter, and the salt of the earth. After work I sometimes drove her home to Wanstead, E. London, in the Rolls, and joked with her that people we passed probably thought I was her pimp. Those were the days. I reply: "Let's meet one day. How are your mum and dad? I liked them. . . I am very fit and well. How are you. Fit or fat?" 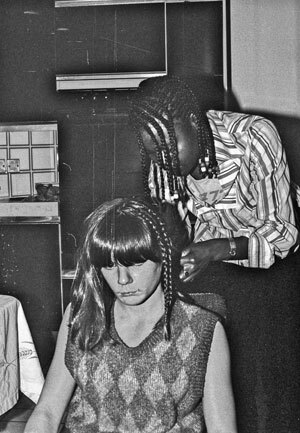 Photo: Wenona braids the hair of Mr Irving's then youngest daughter, Beatrice. "YES, I am still married," she has replied. "All the work you helped with for the wedding, thanks again. I have four children. They are all in their twenties now. I only have one left at Uni. I am not fat, yet! I weigh between 9 stns and 9 and a half stones, so not fat. Although I have to keep a sharp eye on my weight. . . My mother died a few years ago but my father is still going strong. I feel as though I haven't achieved in the employment area and despite my husband and I working very hard we still seem to be not wealthy. But that's England for you. The harder you work the poorer you are. But I am proud of my children and I don't think I have done too bad a job there. What about your children? How are they?" Jessica has her first driving lesson. She comes back thrilled with it. I have here the form from the bank to get you a credit card on the [bookstore] account, like the one I gave Little Angel. I will complete it and mail it to you to sign. Little Angel is our nickname for Jae She has been very helpful. I cook chicken Kiev in garlic for supper, much appreciated by Jessica, but the garlic rather hangs around all night after that. R. WRITES from Iowa: "If you have not discovered it, Jae has written an article for the online Occidental Observer, published Feb. 7, 2012, titled "Only Whites are Racist in Duluth". One may wonder if her new b.f. [boyfriend] likes this. . ."
She writes well, which is the first reason why I offered her the job four years ago, and I stated as much in writing to her: unlike those of almost any other correspondent, her letters are faultless, well composed, and flow well. I paid her well for the work, and I have just topped it up with an eight thousand dollar payment -- slopping over to her the entire "Fabergé Egg fund" I was collecting: it was actually twice her back pay still owing, as I know how easily people will otherwise start whispering, and she will need the money in her new life as a Hausfrau. I still have no rancour whatever toward her. . . Men are basically upright, honest, decent and true, as I often told her. Women behave odd, and I have often rediscovered that fact throughout my life. I am curious about whether she has discovered the flaws in her wealthy new acquaintance yet. . . I am sure she will fare better. After her two false starts with others, I really hope so. He said to me early on that he was "one of us," and admired The Cause, whatever that is. But he is also scared of losing his job, whatever that is, too. . . He will find that he joined the ranks of the Undead as soon as he started dating her. His name will already have found its way onto countless Lists and Indices. It is rather like being bitten by a vampire; or is it a werewolf? I get confused. Yes, Lighthouse Literature is her online bookstore. . . I wish her well with it. If you look back two or three weeks in my Radical's Diary you will see a recent pic of my youngest, Jessica (just 18). The oldest, Josephine, took her own life in 1999, God rest her soul. Never a day passes but I think of her. She replies: "I hope she didn't suffer too much. . . Have you had a second family then? Robert Harris is doing very well for himself. You introduced him to me at your book launch. Of course he was always heading for greatness, don't you agree?" A CUSTOMER tells me that our bookstore no longer allows the use of PayPal. But it does. I investigate. In the evening I begin restructuring my Spring US tour. I also delve into the Admin of the bookstore and find that all the payment options except credit cards have somehow been disabled, which explains why PayPal was not being accepted. A SMUG text comes from B. at two p.m.: "Just had a . . . rather elderly gentleman who was getting into a black Bentley outside the Motcomb telling me that I was a very beautiful and elegant lady and that it would be his pleasure to take me out for dinner! I didn't know what to say so just said, 'Thank you, you are very kind,' and walked off. Why oh why did I not accept?" I am sure it has made her day. (Albert would disagree: he says women are highly offended by such episodes). I interrupt Himmler to reply at once: "Run after him. He is not blind." "Too late. He drove off. Mind you, I am sure I have seen the car there before. I think he is one of the regulars at the Motcomb. Never mind, it cheered me up no end." Women live throughout their lives in a constantly darkening world of self-doubt, no matter how beautiful they are. Fortunate is the man who realizes that fact. REMARKABLE how fast the human body recuperates from savage surgery. Today I find I can for the first time in five or six years, i.e., since confined for a year or more in a solitary Vienna prison cell at the expense of the Austrian taxpayers, tie the laces of my right shoe. A Hoosier [citizen of Indiana] sends me a link. I reply: "Thanks --. No word on our Little Angel in Australia yet I suppose?. . . Wonder how many friends she has lost. Rather sad, really." A large fillet steak for supper. Too much. 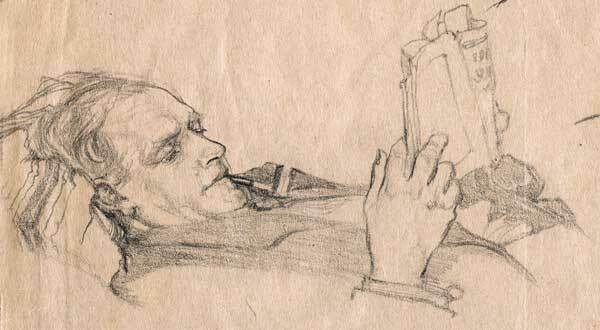 Beryl Irving's sketch of David Irving's father, in the 1920s. Copyright © the Estate of Beryl Irving. AFTER supper Beatrice [fourth daughter] emails me from [my daughter] Brisbane, Australia, that she has completed a webpage commemorating my Mother's life and work as an artist and illustrator. "I finally got around to creating the berylirving.com website." I have a look at it, and it is wonderfully done. Well, that is her professional job, of course, she is a web designer. David Irving: I am just looking at it, Beattie, and it has brought tears to my eyes. Well done, you little rascal. What a super tribute. I will send you some more photos which I scanned from my brother's big album. Beatrice: Thanks, I am really happy with it. Left me feeling a bit depressed the other day after spending a few days looking at all her wonderful artwork, am sad I never met her, she must have been an amazing person. David Irving: She was very patient with us, and I cried for days after she died [in October 1965]. Beatrice: Well judging from all the sketches she did of all of you and the animals, not to mention the observations she made in her articles, she must have been an exceptional mother. David Irving: I am so glad that the many hours I spent scanning those sketches have found a use as wonderful as this. . . How many high grade scans of Dawnchild artwork do you have? We are looking at a commercial reissue of the book, if Auntie Carol does not throw spanners in the works, and Nicky too. . .
Beatrice: . . . Lots of people I think would like to see it published again. I have purchased some of her other books so that I can scan the illustrations and post them on the site. Eventually I will put them into some sort of sorted order with captions and credits. Roger, by the way, read the Dawnchild to our kids and they absolutely loved it, especially James who would ask every night for more. Beatrice: Congrats to Jaenelle, and commiserations to you! I TELL Hugo, who is returning to England: "I will be at the airport to meet you. White car. Washed the bird-poo off it yesterday. Boy, that stuff is tenacious. What are they eating?" FROM four p.m. to 5:20 p.m. coffee with B. at the Cadogan. As flirtatious and beautiful as ever. She is great fun. She chats happily about the elderly gent with the Bentley; I suggest she prepare various blonde chat-up lines ready for the next time she sees him -- "Is that a Rolls?" would work, it would get straight through to a Bentley-owner; and "I've never been in one of those." She says it was one of the latest Bentleys, in his sixties, she would guess. Sounds elderly to me. She asks if there is any word on Jae I describe how she appeared in the Marriott hotel in Warsaw at our group's final dinner in September and sat next to the Australian wearing the thousand-dollar diamond pendant he had given her, which rather wrecked the mood; and she remarks that it was "very unfeeling" of her . . .
Perceptive indeed. -- She has not been wearing her ring for some time because a couple of stones have shaken out of it. She asks if I can get it repaired, and I said of course, I will do that. We are coming up to a twentieth anniversary. Somebody evidently intends pirating my Morell research for a BBC television documentary. . . Can he see the tufts of Hitler's hair that I have? Can they use samples to test? Are the roots still on them? I leave him on ice. Jessica now says that F.'s parents have forbidden her to come to Spain with us. I ask why, and she says, "Because of you, your views." I say, "But they don't know my views." She says: "They are Guardian readers." Nothing wrong with The Guardian, methinks, it is one of my favourite papers too; but I say: "We have no objections to your being exposed to their views. So who are the bigots!" Precisely, says Jessica. I feel a bit sorry for her, as F. -- the school's Head Girl now -- is one of her best friends. I plunge into Himmler chapter 23. I want to understand Himmler and you're the only historian who I think can do that. I remember you mentioning once that Ian Kershaw wrote to you, claiming that his German wasn't good enough to testify at your trial. You might be interested in this video where he speaks at length, and off the cuff, in German without any problems. His accent is far from perfect but he can obviously get his point across so either he's vastly improved or was simply lying about his grasp of the language when he wrote to you. I wrote him in 1999 asking if I could call him as a witness [at the Lipstadt Trial] on the meaning of words in German in the Third Reich, and how they differed from modern meanings. He replied that his knowledge of German was too inadequate, so I did not press him further. I write to Beatrice: "I have already had five emails congratulating us. Thanks for the masterpiece, Beattie. Proud of you." Seconds later Beatrice replies from Australia: "I thought you had added a link, the analytics page showed more than a 190 visits in one day. Also, someone sent me an email with some portraits of you, will forward shortly." I prepare a list of questions for the orthopaedic consultant who performed the operation. Two pm at the hospital for his final check-out. Physio Jill puts me through more gruelling exercises. Then the consultant, and up onto his couch. He pounds, pummels, and twists my left leg, and pronounces everything perfectly healed and full mobility restored. "Yes," I say, "now try the right leg -- the one you operated on." Loud laughter. MY German lawyer has drafted a wonderful four-page reply to the Munich authorities, which has to be in their hands today. He will fax it to them immediately, on my say-so. I thank him: "Bitte sehr. Ich habe diese mit Genugtuung gelesen, wie immer bei Ihren fabelhaft formulierten Schriftsätzen. Ich danke Ihnen." Please accept our thanks (and pass them on to your daughter Beatrice), for the enchanting online display of your mother's artwork. Fanny and I really enjoyed them. Thank you so much, Robert. My mother died over forty-five years ago, and you can imagine how pleased and proud I was when Beatrice last week sent me that website to look at. . .
Having said which, I was never hugely happy that she had moved to Brisbane. But she found a fine Australian man to marry, and that is going to last and last. She has two beautiful Australian children, and is an Australian citizen and civil servant. When reminded of this, [your prime minister] John Howard (left) told your parliament, "I don't care that this gives Mr Irving the automatic right to enter Australia, we've changed the law once to keep him out" -- the Immigration Act, introducing a new "bad character" criterion! -- "and we will change it again if necessary." Is your Government in "their" grip, or isn't it! Yes, that ban was imposed in February 1992, twenty years ago this month. Ah, the great freedom-loving democracies! Gerry Adams, I.R.A. murderer and terrorist: "good character," allowed to tour Australia since then; David Irving, British historian and author of thirty well reviewed books, "bad character", permanently banned. I SPEAK this afternoon on Winston Churchill and the efforts of MI6 to drag the United States into World War II. Searching for my file of supporting documents, I ask K.: "I am racking my brains -- where did I last speak on this same topic? It was within the last six months, and for the life of me I cannot recall. Was it UK or USA?" Then I recall: "It was the boat cruise in November, I recall now" -- the one where I had Jae selling books at my "amphibious" lecture on the Potomac. Jae is relentless; after all, she is running a big bookstore for us now: "If we sat down and totaled it up, I think you'd find my actual basic necessities are more than yours at present." 2:45 p.m. we get to the West End location three-quarters of an hour late because of the Hammersmith Flyover problems, which I had forgotten. We have only fifteen minutes before the function is due to begin. People are already crowding in. Helping hands whisk our half ton of boxes upstairs. Many congratulations on the total defeat of The Limp and much else. People notice I have lost much weight. But it will be some time yet before I can run a triathlon or climb mountains. Perhaps I can enter for the Tchaikovsky Prize at the Moscow Conservatoire, like my old friend the late John Ogdon (he won it jointly with Vladimir Ashkenazy: Guess which winner got the bookings); but I'd have to learn the piano first. The room fills, more chairs have to be carried in from the balcony, from next door and from downstairs until over sixty or seventy are packed in, in front of, next to, and behind me. We'll need a larger room next time. Michele Renouf wants to film, I groan and allow it, although I tell her it greatly inhibits what I feel safe to say. She is incorrigible. We really must point out on our ticketing pages that filming and recording are not allowed without advance permission. 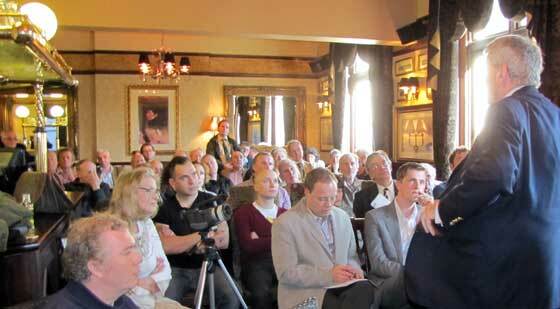 My talk on how Churchill and MI6 tricked the United States into World War II goes well. I cite the material which Prof. Thomas Mahl used at our 2002 Cincinnati weekend -- for which he was heavily disciplined by his own university and directed to break off all contact with us; and I show them Chaim Weizmann's three-page September 10, 1941 letter to Churchill, in which the Jewish Agency leader promised that if treated nicely by Britain the Jews could drag the United States in: "We did it before, and we can do it again," he said, referring to their success in World War I. Finally I dwell on how we withheld forty-eight of the vital MAGICS, the decodes of Japanese diplomatic messages, from the American Intelligence service because of a mid-level spat between them and our MI6 pointman in Washington, Captain Eddy Hastings. K. mans the books table and Hugo the entrance, clocking people in and out and collecting all the entrance money. Several folks have come from Europe for the event. Marcus G. has come from Germany, and a bright young man from Bad Pyrmont. Arthur L. has come from Eindhoven, Holland. We sell all the "Churchill's War", vol. ii: "Triumph in Adversity" which I brought with us. . . They all plead for me to come back soon. AFTERWARDS I invite Hugo and K. to supper at The Swan. There are four members of our Poland "Wolf's Lair" tour group there, so the conversation soon drifts on to Jae and her wealthy Australian acquisition. Anthony L-W. sits next to me, solemn and serious as always; he mentions that he received a disturbing email from her around Christmas, saying she was un-friending everybody who was on our trip, because somebody had leaked something from her Facebook page. Tony was quite hurt by the accusation. "I was also 'defriended' on Facebook by . . . Jae I would have thought our hospitality counted for more than that. . . No great loss." HOW MANY MORE OLD FRIENDS did Jae dump to humor the Interloper, as she once called him. The power of money! It is untrue, and I told him so. One of her Hoosier friends had sent me something about Jae, knowing we are pals, that was all. Tony adds: "I was not prepared to be un-friended by her, so I cut off my 'friending' to get it in first!" Graham G. leans across him and says, "She never sent that email to me." Then he realises, "But I am not on Facebook." Facebook: It sounds like an invitation to murder, it ends friendships all round at the drop of a hat, and most for no reason. It caused Hugo the most intense problems with his sister, a charming lady, because of what it revealed two years ago about her husband. As for Jae: I often wonder how she is doing? I do hope her dreams in Australia are coming true, or most of them. I have now received twenty or thirty emails from her former friends. That email to Tony wasn't exactly spreading Christmas cheer. I urge them all to bear with her, as this is a turbulent time, and she is a lovely person. This . . . behaviour is . . . slowly eroding the fine reputation she had won among conservatives. [---] has a lot to answer for. We leave around 7:45 p.m. God, some folks are slow eaters. Back at Kew, I turn in at nine-thirty, as the television is showing war movies on the History Channel. Having been writing on World War II all morning, and spoken on it all afternoon, I think my belly is full. Jaenelle Antas writes: "Only Whites are Racist in Duluth"